ST. ANDREWS, NEW BRUNSWICK--(Marketwire - Feb. 13, 2012) - Portage Minerals Inc. ("Portage") (CNSX:RKX) today announced final diamond drilling results from its 100% owned Golden Pike property (the "Golden Pike Property"). The recently completed drill program consisted of 17 holes plus the extension of 4 existing holes for a total of approximately 2,700 metres drilled. The program focused on delineating and expanding the high grade gold zones on the South Trend deposit where previous drilling returned gold intersections such as 43.07 g/t gold over 13.00 m, 32.26 g/t gold over 10.06 m and 8.08 g/t gold over 7.72 m.
Roger Dahn, Vice President - Exploration, stated, "We are encouraged by the continued high grade results being encountered on the South Trend Deposit. The Golden Pike Property hosts a significant gold target with excellent potential to continue to increase the resource base. Demonstrating the larger scale potential at Golden Pike is the fact that property-wide exploration has identified a number of other high-potential targets along each of the South and North mineralized trends. Areas of particular interest include gold in soil geochemical anomalies and areas with induced polarization (IP) signatures similar to those of the mineralized zones." The Company controls an approximate 10 km x 40 km land position (100% owned) surrounding the Golden Pike project and the Company's Bald Hill Antimony discovery (Portage Minerals Inc. news release dated November 10, 2010) within the prospective Annidale Gold Belt which hosts 30 known gold occurrences. Drill program focused on delineating and expanding the high grade gold zones on the South Trend deposit. All drill hole intercepts are outside the current resource outline, therefore the overall program is expected to expand the August 19th 2011 mineral resource estimate for the Golden Pike Property. The mineral resource is located within a 600 m segment of the South Trend and remains open for expansion in both directions. These drill results indicate considerable potential to expand the South Trend Deposit, which has only been tested by drilling to a maximum depth of about 350 m within a 600 m segment of the South Trend. The South Trend mineralized system strikes northeast-southwest and dips steeply to the west. The mineralized system remains open for expansion at depth and along trend. A table of significant assay results from the current program and a longitudinal section of the South Trend Deposit, are the attached at the end of this news release. 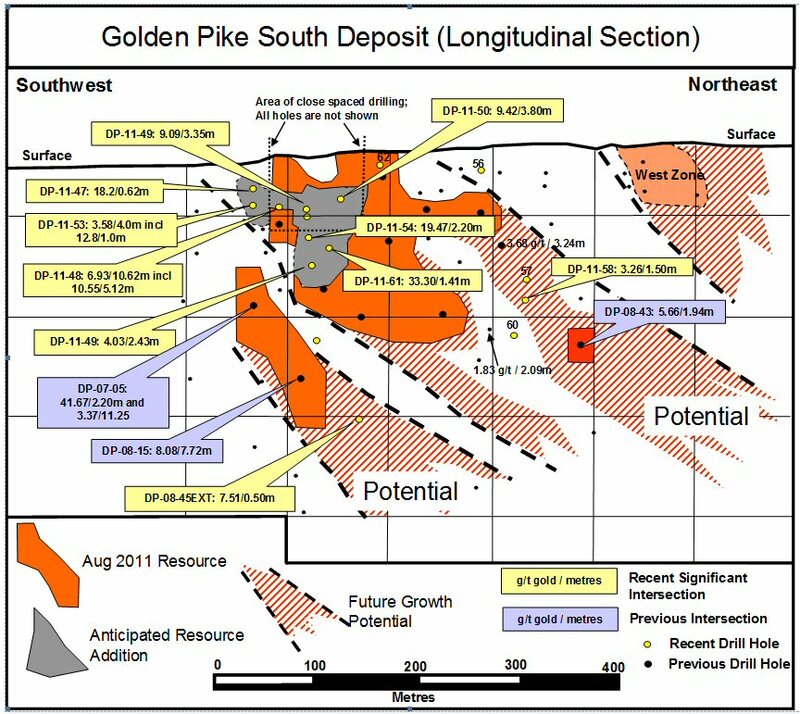 All drill hole intercepts from the current drill program are outside the August 19th 2011 resource outline and the overall program is expected to expand the mineral resource estimate for the Golden Pike Property. Primarily, three vein zones (Main, Middle and Parallel) form the mineral resource. The South Trend mineral resource estimate as of August 19th 2011 contains an Inferred Mineral Resource of 214,800 tonnes at a grade of 9.60 g/t gold (capped) yielding 66,300 ounces of gold (for comparison purposes, the uncapped grade is 13.48 g/t gold yielding 93,100 ounces gold). The gold mineralized quartz vein systems of the South Trend Deposit are hosted by mafic volcanic rocks proximal to a volcanic-sediment contact. The mineralized vein zones consist mainly of quartz and carbonate with or without sulphides. Gold-rich sections of the vein system correlate with higher sulphide content and/or sections containing visible gold. Pyrite is the most common sulphide but chalcopyrite, minor sphalerite and galena have been observed. Arsenopyrite is generally absent from the assemblage. Assays were performed by Activation Laboratories Ltd, Ontario, using the fire assay method (1A3-50) on 50 grams of prepared sample. Metallic screen fire assays (1A4) were also completed for drill holes DP-11-48, DP-11-49, DP-11-58, DP-11-61 and DP-08-45EXT on 1A3-50 results which were greater than 1.0 g/t gold. The Golden Pike Property comprising 1,600 hectares is located 60 kilometres southeast of the City of Fredericton in Kings County, New Brunswick. The Golden Pike Property is owned 100% by Portage and is subject to a 2.0% net smelter return ("NSR"). Portage can purchase half of the NSR (1%) for $500,000 per 0.5% NSR increment. Full disclosure of Portage's previous drill programs and the Golden Pike Property resource estimate are available within the Portage news releases dated November 12, 2010, August 24, 2011 and December 21, 2011. An NI 43-101 compliant technical report on the Golden Pike Property describing in detail among other things, the resource estimate, QA/QC, database validation and geologic model, was filed on SEDAR on September 8, 2011. Roger Dahn, P. Geo. (New Brunswick), Vice President-Exploration of Portage, is designated as the Qualified Person under National Instrument 43-101 and has reviewed and approved the contents of this news release. Portage Minerals Inc. is a mineral exploration corporation exploring for gold in Eastern Canada. Further information about Portage can be accessed on Portage's website at www.portagemineralsinc.com and on the SEDAR website at www.sedar.com. The common shares of Portage trade on the Canadian National Stock Exchange ("CNSX") as a mining issuer under the trading symbol "RKX". To receive Portage news releases via email, please advise aman@chfir.com and specify "Portage News" in the subject line. This release and other written or oral communication from Portage may include certain statements that may be considered "forward-looking statements" within the meaning of that phrase under Canadian securities laws. Statements other than historical facts that address possible future events, plans or developments are forward-looking statements. Such statements may be identified by the use of words such as "will", ""may", "expects", "estimate", "intend" or the use of the future or conditional tense. Certain material factors or assumptions were applied in drawing our conclusions and making those forward-looking statements. Forward-looking statements reflect management's current views with respect to possible future events and conditions and, by their nature, are based on management's beliefs and assumptions and subject to known and unknown risks and uncertainties, both general and specific to Portage. Although Portage believes the expectations expressed in such forward-looking statements are reasonable, such statements are not guarantees of future performance and actual results or developments may differ materially from those in our forward-looking statements. Readers are cautioned that risks may change or new risks may emerge. Additional information regarding the material factors and assumptions that were applied in making these forward looking statements as well as the various risks and uncertainties we face are described in greater detail in the "Risks" section of our annual and interim Management's Discussion and Analysis of our financial results and other continuous disclosure documents and financial statements we file with the Canadian securities regulatory authorities which are available at www.sedar.com. Portage undertakes no obligation to update this forward-looking information except as required by applicable law. About this company Portage Minerals Inc.